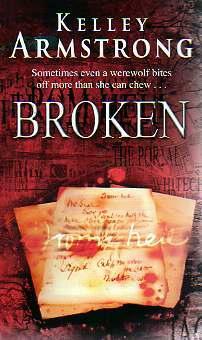 My thoughts: Broken is the sixth in the Women of the Otherworld series by Kelley Armstrong. It is narrated again by Elena as the 1st and 2nd book of the series. I'd give 6 stars for the plot and 9 for the Armstrong storytelling (so that's how the final 7 stars came). I haven't skipped any books in the series, read them in chronological order, so I wasn't lost when some newer characters or other supernatural species, entities (cabals, interracial council) were mentioned. Still, Bitten is the novel I remember loving and being amazed by it the most, I don't know if that is because it was my first Kelley Armstrong book, or because I love Elena's narrating, so I was very happy and looking forward to Broken, to finally get back to Elena after 3 books narrated by other characters (though I loved the ones narrated by Paige very much also! ), but unfortunately, I was a bit disappointed by Broken. Don't get me wrong, Kelley's writing style is still there and going strong, her sarcastic, bitingly funny dialogues are also there, making you crack up laughing out loud, her characters are still very present in the flesh, and she certainly knows how to build suspense and describe fights, what was underwhelming was the plot, the main mystery. Opening a portal and letting Jack the Ripper out on the loose? it sounds exciting, but somehow, maybe to maintain the mystery until the very last moment, we don't get too much a glimpse of it, all we see and read about are the rotting, decomposing zombies, and that made me feel like the book dragged on, and nothing crucial or terrifying happened (the murders committed weren't described that much, so they couldn't convey the brutality). But the characters are the very strong and sure skeleton of this novel, Clay is still an irresistible protective macho-man/wolf, Nick is still the charming nice guy, who makes you want to hug him, and new characters get introduced, one of them is especially fantastic: Zoe Takano. She made me laugh so much! And of course, Armstrong didn't lose Elena's voice along the road, so it still is a very enjoyable read.